"Stained Art Glass CHICKADEES Framed Suncatcher" A pair of cheerful chickadees perches inside a pretty blue oval in this wood-framed decorative art glass panel. 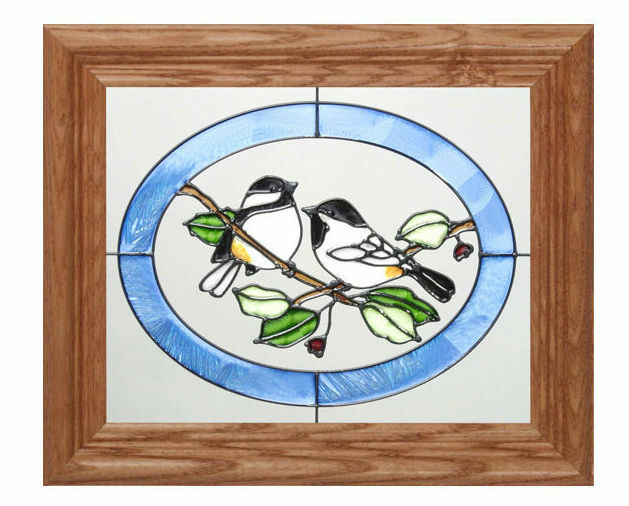 Wood-framed in high-quality Wisconsin hardwood and handpainted in vivid colors, this vertical panel measures 12.5" wide x 10.5" high, and comes with two frame-top hooks for hanging. Specify your choice of frame finish: Medium Oak (standard-shown), Whitewash or Barn Board. PLEASE NOTE: Shipping ONLY within the continental U.S. Hawaii, Alaska, and Puerto Rico residents please contact seller for shipping quote before ordering.